Semi-finalists in early June in Shenzhen when beaten by the champions elect, the Chinese combination of Fan Zhendong and Lin Gaoyuan; the host nation’s Jang Woojin and Lim Jonghoon climbed one step higher on Friday 20th July in the Men’s Doubles event at the Seamaster 2018 ITTF World Tour Platinum Shinhan Korea Open in Daejeon. The no.6 seeds, they beat Chinese teenagers Wang Chuqin and Xue Fei, a pairing of whom we will no doubt hear much more; they succeeded in four games (12-10, 5-11, 11-8, 11-4) to reserve their place in the final. 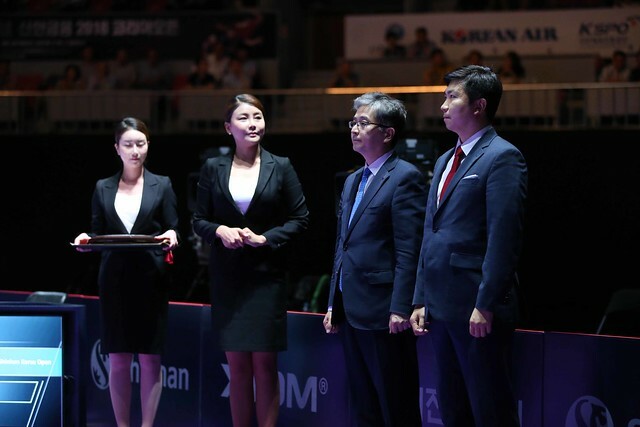 No doubt the support from the adoring and most vocal crowd was a telling factor but did the defeat in Shenzhen at the Seamaster 2018 ITTF World Tour Platinum Kaisa China Open play a factor? On that occasion the reverse experienced by Jang Woojin and Lim Jonghoon was by the very narrowest of margins (11-5, 6-11, 3-11, 11-6, 14-12); no doubt that result gave a major injection of confidence. Success for Jang Woojin and Lim Jonghoon, for the outfit formed by the host nation’s Lee Sangsu and DPR Korea’s Pak Sin Hyok it was defeat. They were beaten in five games by Hong Kong’s Ho Kwan Kit and Wong Chun Ting, the top seeds (11-9, 13-11, 3-11, 4-11, 11-7). Defeat for Wang Chuqin and Xue Fei, no Chinese pairing in the final; in the Women’s Doubles event the scenario is the complete reverse with the Korean Peninsula experiencing defeat. Chen Meng and Ding Ning, the no.4 seeds, recovered from a two games to nil deficit, to beat the host nation’s Jeon Jihee and Yang Haeun, the no.2 seeds, by the very narrowest of margins (9-11, 9-11, 12-10, 11-5, 11-9); Wang Manyu and Zhu Yuling, the no.3 seeds, ended the adventures of DPR Korea’s Cha Hyo Sim and Kim Nam Hae in three straight games (11-9, 15-13, 11-7). The finals of both the Men’s Doubles and Women’s Doubles events will be played on the afternoon of Sunday 22nd July.